Built in WiFi, DVD-RW. COA: Windows 7 Pro. For sale we have SOFTWARE INSTALLED: Windows 7 Professional 64-bit, Open Office 4.0.1. (Software cd not included ). Otherwise a clean and tidy looking laptop. My wife has used this lap top for a number of years but she has just bought a smaller machine so it is time for this one to go. Several years ago we upgraded the memory and about 6 months ago we fitted a new battery. It appears to be able to run on the battery for 4 or 5 hours. The hard drive has been wiped and a fresh install of Windows 10 Professional has been loaded and fully updated to April 2019. An early version of Microsoft Office has been loaded that includes Word and Excel. There is a DVD burner. The original Toshiba power supply and mains lead are included. Overall the laptop is in good condition but there are some scratched on the outside case as you would expect from a machine of this age. Dispatched with eBay delivery – Shutl 1 day.Or collection from DE4 Derbyshire Dales. Processor AMD SEMPRON. Toshiba L300D. VLC Player- Good For Watching Movies. Hard Drive 160 GB. Optical Drive DVD CD RW. Our range of computer system are suitable for professional and students alike. The Warranty does not cover battery life. Toshiba Satellite L300-1bw 15.6", Windows 10 Pro. Condition used An old pc with Windows 10 on. It runs slow but it does work. I'm No expert, but a bit of tinkering and this would be a perfectly good machine. I've added a couple of photos to show the tech stuff this machine has. 120Gb Hard Drive. All previous user files have been removed. Linux Debian Fully installed. This is a powerful Laptop that has been processed through our system. The full specification is detailed below and upgrades are available if required. Our Process for each Laptop involves. 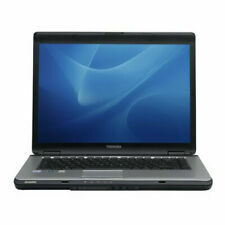 FAST Toshiba Satellite Pro L300/A300 Intel Dual Core 3GB RAM 160GB HDD DVD Win7. Optical Drive DVD RW. VLC Player- Good For Watching Movies. Hard Drive 160 GB. Our range of computer system are suitable for professional and students alike. The Warranty does not cover battery life. AMD Turion X2 Dual-Core RM-70. BATTERY MISSING - THE LAPTOP IS SUPPLIED WITH NO BATTERY. Software COA. No (Requires 19 Volt 3.90 Amp Power Adapter). Power Adapter. Built in WiFi, DVD-RW. SOFTWARE INSTALLED: Windows 7 Professional 64-bit, Open Office 4.0.1. (Software cd not included ). COA: Windows 7 Pro. For sale we have Otherwise a clean and tidy looking laptop. Wi-Fi is supplied by the Realtek RTL81878 Wireless Adapter which has been tested. Here is a powerhouse of a Toshiba Laptop! There are a few issues with is Laptop as follows WITH WINDOWS 7, OFFICE AND BAG. Dual Core CPU 2.0 GHz. Nice laptop ideal for general usage. Hard Drive : 250GB SATA. CD Drive : DVD /-RW. AC Adapter : Included. Battery : Minimum 1 hour standby. Webcam YES. Hard Drive 160 GB. Open Office- Good For Word Processing, Spreadsheets, Presentations, Graphics, Databases and more. VLC Player- Good For Watching Movies. Optical Drive DVDRW. Our range of computer system are suitable for professional and students alike. ComputeUK - Suppliers of new and used Computer and IT related products. Yes (Supplied With Power Adapter & Power Cable). Power Adapter. Display Technology: LCD. Screen Size: 15.5 in. Colour: Black. Laptop is in excellent condition and running well. Sound - Perfect working condition. ComputeUK - Suppliers of new and used Computer and IT related products. Battery Has Life And Is Performing Normally. Power Adapter. 160GB HDD 2GB RAM 2.0Hz USB 2.0 WIFI DVDRW win7 WEBCAM. Hard Drive: 160GB. TOSHIBA L300 LAPTOP 15.4" SCREEN. Model: TOSHIBA. Network: Internal 10/100/1000Gigabit Ethernet Card. RAM: 2 GB DDR2. 1 x LAPTOP. NO A/C ADAPTOR. & BATTERY NOT WARRANTED. Silver/Black housing, 15.4", Core2Duo T7300 2.0 GHz, 3GB RAM, 120GB HDD, Windows 10 Pro 64 bit. The laptop has webcam and CD/DVD. DVD SUPER MULTI DRIVE (2LAYER). Hardly used. This is in very good working condition. Windows Vista Business can be upgraded to Windows 7 for £25 New condition - no marks 3gb ram. 1.66hz Hardly used in immaculate condition Please see pictures for specifications 15.4 inch screen size I have an extra memory ram card in here too so you won't need one for a while. Hello. For sale toshiba portage r700-183..Laptop in very good condition, after refreshed windows 7 professional.Laptop is not necessary for me because I spent on a stacionarny computer a few months ago and the laptop is not used thanks. GENUINE Toshiba Laptop Keyboard - Not generic rubbish. Keyboard Layout:Uk English QWERTY. SENT IN A KEYBOARD BOX NOT A FLIMSY JIFFY BAG. Also this is UK version. On Shelf ready for dispatch. NOT Web Cam 3c. Toshiba Sat Pro L300 Complete Base. NOT INCLUDED. NO HARD DRIVE MAY OR MAY NOT HAVE PLASTIC COVER. All motherboards have been stress tested with. Screen cable. NO BATTERY. Ethernet socket & cable. Toshiba L300-1BW 15.4" (175GB, Intel Pentium Dual-Core, 1.66GHz, 1GB). Installed with Microsoft Windows 10. Condition is Seller refurbished. Dispatched with eBay delivery – Shutl 1 day. NOT WEB CAM2a. Toshiba Sat Pro L300 Complete Base. NOT INCLUDED. NO HARD DRIVE MAY OR MAY NOT HAVE PLASTIC COVER. All motherboards have been stress tested with. Wifi cables. NO BATTERY. Screen cable. We do free diagnoses and we fix on "No Fix, No Fee" basis. Genuine part, Used but in good condition. Real Pictures. If you can't find it then give us a call and we will find it for you. Item may have light scratches or scuff marks. TOSHIBA SATELITE PRO L300 SERIES INTERNAL SPEAKERS PAIR LEFT & RIGHT . Condition is Used. Genuine Toshiba Satellite L300 LCD Screen Bezel V000130010 B0247001K100. It is in good Used condition. Toshiba PA3534U. Numéro de pièce fabricant PA3534U. ORIGINAL TOSHIBA battery. Toshiba PA3533U. Toshiba PA3533U-1BAS. Toshiba PA3533U-1BRS. Toshiba PA3533U1BAS. Toshiba PA3533U1BRS. POWERS TO BIOS. SOLD AS SPARES. NO OTHER TESTS DONE. KEYBOARD HAS A CURVE. ONE MOUSE BUTTON IS LOOSE. NO HDD OR CHARGER. BATTERY MISSING. SCRATCHES AND WEAR FROM USE. MAY HAVE FAULTS NOT MENTIONED IN THE DESCRIPTION. MAY HAVE PARTS MISSING NOT MENTIONED IN THE DESCRIPTION. SEE PICS FOR HELP WITH CONDITION. There are screws missing. There is a crack in the lid. There is a key missing. Missing HD and RAM covers. No battery. Optical drive: DVD-RW. USB, LAN, Webcam, VGA.